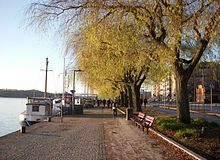 Norr Mälarstrand, a waterfront walk. Kungsholmen is an urban island which makes up the western part of Stockholm's inner city, with the Stockholm City Hall, Stockholms stadshus, as a dominant landmark. The eastern part of Kungsholmen is densely urban, and contains much of Stockholm's legal system: the national police board with the country's largest jail, and the Stockholm district court (Stockholms tingsrätt), as well as many government functions, such as the City Hall, and the County Council building. The north-western part of the island is under development, with new hotels, shops and restaurants, as well as residential areas. The islands Stora Essingen and Lilla Essingen also belong to the borough. The E4/E20 expressway Essingeleden runs across these islands, as well as Kungsholmen. Most of Kungsholmen is reached by subway, from Norrmalm, Vasastan, Västerort and Solna. The scenic Västerbron ("Western Bridge") connects to Södermalm. See Stockholm#Public transport. 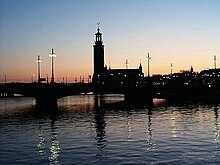 While most visitors to Stockholm see the City Hall, few of them take the opportunities to see the rest of Kungsholmen. Still, the waterfront is walkable around most of the islands, and there is a variety of restaurants, cafés and stores. 59.3275418.054161 Stockholm City Hall (Stadshuset), Hantverkargatan 1 (T-Centralen). The city hall, where the Nobel Prize Banquet takes place every year, is an imposing brick building in the city centre. Guided tours are held daily, and allow you to see the impressive halls used for the Nobel festivities, the Blue Hall and the Golden Hall. The tower offers a great view of the Old Town and can be climbed (optionally, a lift can take you half the way). Public daily tours run several times a day, 110 kr. Tours to the City Hall Tower run about 10 times a day May–September, 50 kr, tickets are only sold on the day of the visit. 59.3289618.048782 Kungsholmen Church (Kungsholmens kyrka). Not Stockholm's greatest church. However, it is centrally located, still calm and secluded. Occasional concerts. 59.330918.04333 Stockholm Court House (Stockholms Rådhus). The courthouse from the turn of the century with its massive tower is regarded as one of the foremost examples of Swedish national romanticism architecture, with a successful 2000s restoration. Open to public at weekdays; security checkpoint at front door. 59.33318.00494 Kristineberg Palace (Kristinebergs slott). Built around 1750 by the merchant R. Schröder, with a beautiful park. Today used partially as a school and partially as dwelling, though you can still watch it from the outside. Smedsuddsbadet is good for all ages. 59.3252118.021591 Smedsuddsbadet. The largest beach in inner-city Stockholm is child-friendly. 59.3305117.99612 Fredhällsbadet (T Kristineberg). A rocky beach on western Kungsholmen. 59.3262418.023523 Boulebar (T Fridhemsplan), Smedsuddsvägen 2. Food, drinks and boule pétanque. 59.3405518.006274 Hornsbergs strand (T-Stadshagen). An artificial beach, acclaimed for its design. Crowded at summer. 59.3348318.032081 Västermalmsgallerian, Fleminggatan 43 (T Fridhemsplan). M-F 10:00-19:00, Sa 10:00-17:00, Su 11:00-17:00. Opened in 2002, Västermalmsgallerian on Kungsholmen is good-looking but relatively small. 59.3372618.010042 Lindhagenhuset, Lindhagensgatan 118. A shopping mall at the front of a big parking garage, with about a dozen shops. The Thai diner at the top floor has a good view of the neighbourhood. 59.3297718.03663 Vilse i Garderoben, Hantverkargatan 59. Second hand store. Eastern Kungsholmen is packed with restaurants of different price levels. 59.3331118.03141 Café Fix, Sankt Eriksgatan 35. Stockholm's oldest coffee shop. 25 kr for coffee, 5 kr for refill. Nice food. 59.3307518.043522 Rådhuset, Scheelegatan 7. A café inside the impressive district courthouse, Stockholms tingsrätt. A metal detector (for courtroom security) at the entrance might deter some guests. 59.3336218.030433 Restaurang Ät Gott, S:t Göransgatan 74. A diner with traditional Swedish food. 59.329418.04134 Salt, Hantverkargatan 34. A casual diner with Swedish and international food. 59.3290918.044745 Mäster Anders, Pipersgatan 1 (T-Rådhuset), ☎ +46 8 654 20 01. French and Swedish cuisine with an emphasis on grilled meats. Mains 145-295 kr. 59.326518.043656 Kungsholmen, Norr Mälarstrand, kajplats 464 (T Rådhuset). Maybe on the expensive side of what constitutes mid-range, but this refined food court concept in a beautiful Kungsholmen quay location offers large portions of really tasty food in a variety of styles. Mains 175-260 kr. 59.3274918.034327 Mälarpaviljongen, Norr Mälarstrand 64. A self-service café at the waterfront. 59.3230118.007198 Lux, Primusgatan 116 (Lilla Essingen, bus 1), ☎ +46 8 619 01 90. Tu-Fr 11:30-14:00, 17:00-23:00, Sa 17:00-23:00. In a waterside location on one of Stockholm’s smaller islands, Lux offers a relaxed atmosphere and some very good modern cooking. Mains 315-345 kr, tasting menu 940 kr. One Guide Michelin star. 59.3294118.04329 Wijnjas, Scheelegatan 3. An old-fashioned basement with cheese and wine tasting. Kungsholmen by night. The cranes are building Hagastaden in Solna. Bars in Kungsholmen are concentrated around Fridhemsplan, and along Fleminggatan and Hantverkargatan. Prices are usually lower than the rest of the inner city. 59.3355318.033151 Dovas, S:t Eriksgatan 53 A. Cheap beer, 30 kr for a 500 ml bottle of Norrlands Guld or another local ale. There is a nightclub opposite which most of the young locals seem to disappear into when this place closes. 59.3357718.033352 Theodoras, S:t Eriksgatan 53 B. About 10 metres further down the street, with the same owner, it is basically a quieter copy of its brother, Dovas. 59.3324518.028463 Nivå 22, Fridhemsgatan 17. A low-end pub with a roof deck, where one can drink and smoke at the same time. 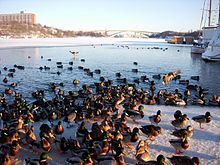 The accommodation options in Kungsholmen are limited, so you can consider staying in neighbouring Norrmalm or Vasastan where there are more thereof. 59.337618.01541 Belman Hostel, Sankt Göransgatan 151 (T-Stadshagen), ☎ +46 73 9308691. A low-cost hostel. Dorm 210 kr. 59.3313618.031052 STF Fridhemsplan, Sankt Eriksgatan 20, ☎ +46 8 653 88 00, e-mail: info@fridhemsplan.se. One of the largest and most modern hostels in Stockholm. Doubles from 550 kr. 59.3361818.028183 Connect Hotel City, Alströmergatan 41, ☎ +46 8 441 02 20. The cheapest rooms are very small and windowless. From around 1,000 kr for a double. 59.3341118.03274 Aldoria, Sankt Eriksgatan 38, ☎ +46 8 693 63 00, e-mail: info@aldoria.se. Doubles from 1190 kr. 59.337318.03235 M/S Monika, Kungsholms Strand 133, ☎ +46 8 120 921 00. A refurbished 1908 sailboat. From 1000 kr. 59.331318.021556 Courtyard Stockholm Kungsholmen, Rålambshovsleden 50 (T: Thorildsplan), ☎ +46 8 4413100, fax: +46 8 4413199. The only Marriott hotel in Stockholm. Rooms with internet, aircon, coffee maker, ironing board, fridge and safe. The hotel has a fitness centre and a restaurant with local and international cuisine. Expensive parking at 295 kr. Around 1,200 kr for a double. 59.3312918.045437 Clarion Hotel Amaranten, Kungsholmsgatan 31 (T: Rådhuset), ☎ +46 8 6925280, fax: +46 8 6504050, e-mail: amaranten@firsthotels.se. Rooms with internet. Around 1,300 kr for a double. Kungsholmen contains the national police headquarters, with heavy law enforcement presence, and is generally safe. Fridhemsplan is a nightlife district, with some risk of drunk brawls in the evening. Hornsbergs strand gets crowded in summer, with antisocial behaviour as a consequence. As Kungsholmen's beaches get crowded (by Swedish standards), use common sense for water sport. This district travel guide to Kungsholmen is a usable article. It has information for getting in as well as some complete entries for restaurants and hotels. An adventurous person could use this article, but please feel free to improve it by editing the page. This travel guide page was last edited at 13:28, on 13 January 2019 by Wikivoyage user Traveler100bot. Based on work by Wikivoyage users Matroc, FTMDave, Yvwv, MSG17, Ground Zero, MartinJacobson, Kiaora, Wrh2Bot and WOSlinker and others.